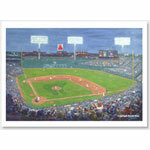 Yawkey Way limited edition Gicl�e print by Kevin Shea oringinally painted in the pregame atmosphere of Fenway Park. Features the excitement and anticipation of the Boston Red Sox 2007 World Series Championship. We Believed! In vibrant, colorful brush strokes for the world's greatest sports fans at America's most beloved ball park. Available on fine paper; size 14� x 18�. Framed size 20� x 24�. Framed canvas size 18� x 22�. Each limited edition print is signed and numbered by the artist. Framing adds 1-2 weeks to the delivery time.